Jamshedpur town is located in East Singhbhum district of Jharkhand state. The city is the largest and the most populous agglomeration in the state and a major industrial zone in Eastern India. Jamshedpur is the first planned industrial city of India and it was founded by Jamshedji Nusserwanji Tata. It is even known as Steel City, TataNagar or simply Tata. The Dimna lake, formed by a dam near the town in the early 1940’s by the TATA Steel company, serves as a water source for the Tata Steel Plant and the city itself. During the monsoon, the reservoir gets filled up in the rain water. In another time if the water fall below a certain level the water is pumped from Subarnarekha Dam in Chandil. 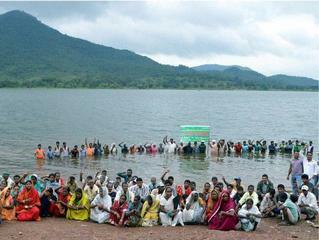 During the construction of the dam about 2,000 families from 12 panchayats (Villages) under Patamda block were displaced . Since then the villagers protested for suitable compensation. Recently, in 2013 descendants of displaced families were arrested while trying to lock up Tata Steel offices near the dam site. 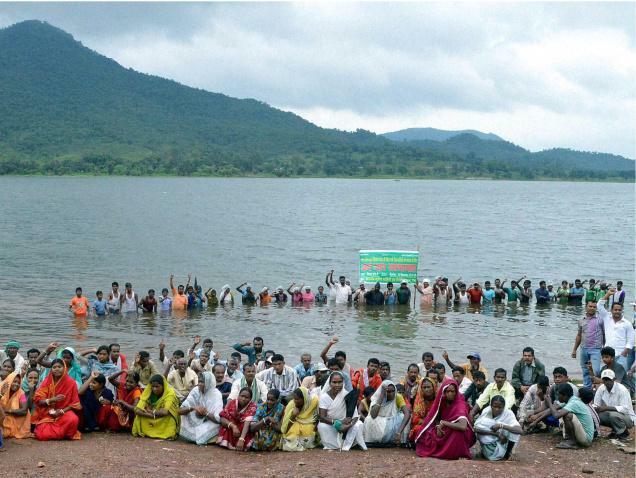 The protestors also did a jal satyagraha by standing in waist-deep water in Dimna lake and marched from the agitation site to the Tata Steel’s office to raised their protest. Police has taken the protestors into their custody and stopped the agitators  In another kind of conflict, the land owners who has the cultivable lands at the periphery of the dam claimed that their crops are damaged every time during the monsoon season when the water of the lake raised above the 520ft (from sea level). Hence land owners have requested Tata Steel authorities to maintain the water level at or below 520ft and open sluice gates if water went beyond that level. However, if the dam authority maintain the water level below that level may cause water scarcity in the Tata steel plant as well as Janshedpur (Tatanagar) city . Project Details Dimna Lake was constructed and owned by TATA Steel. It covers about 5.5 square kilometers. Around 1,861 acres were acquired under the Land Acquisition Act of 1894 for the dam  The Lake is the only source of drinking water for Jamshedpur town. During the monsoon, the reservoir gets filled up in the rain water. In another time if the water fall below a certain level the water is pumped from Subarnarekha Dam in Chandil . Why? Explain briefly. The land losers are seeking suitable compensation and other livelihood options for example fishing or boating right in the lake. For the submerged land, protestors are asking for the demarcation of the land and suitable compensation or else they will protest every time if the water raise above the limit (520 ft) [2, 3].